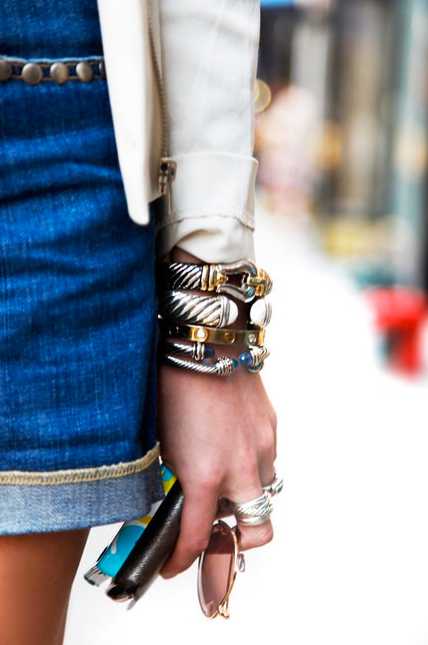 There's an art to stacking bracelets, and one key trick is to mix metals, styles (vintage and modern) and textures, as shown above. These stunning--and well-priced!--pre-mixed sets from Noir Jewelry, Ashley Pittman, Topshop, and River Island make stylish arm parties fast and easy. Hey, I love your blog. Seriously. Love it. Wanna come over to my closet and tell me what to wear? Love your blog too! I'll let you know the next time I'm in NYC! So happy to hear from you--and know that our tastes are aligned! Would love to meet up one of these days!